Free Shipping Included! Medline G30270AH Locking Raised Toilet Seats with Arms by Medline at Bijc. SKU: MPD12159. MPN: G30270AH. Hurry! Limited time offer. Offer valid only while supplies last. Makes using the toilet easier for those with trouble bending. 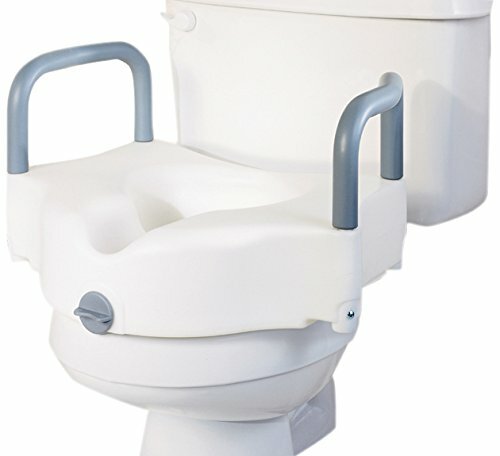 Raises seat height 5'' (12 cm) above the toilet. 350-lb. (136 kg) weight capacity. Makes using the toilet easier for those with trouble bending. Raises seat height 5" (12 cm) above the toilet. 350-lb. (136 kg) weight capacity. Padded arms.